The text of this book is written out in relaxed Romans on Italia paper and then folded into a concertina format, which was sewn to the pastepaper wrap-around cover. The book opens horizontally and the book drops down as it unfolds, attached to the cover at the top. 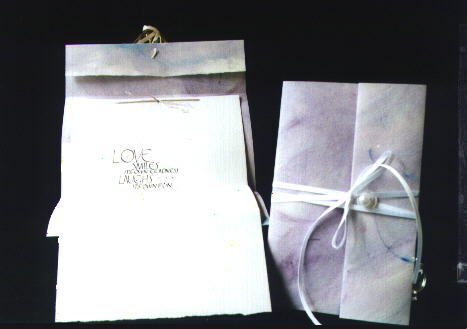 The cover is the artist's pastepaper (both sides) in delicate lavenders and blues, swirled on. The text was written with Brause nibs, black ink and gouache, then reprinted on various papers. Ribbon closure which wraps around button/pearl to secure.